1. College Football Season is HERE!!! Tomorrow is kick-off for my two Oklahoma teams and I can NOT wait! It’s feeling a little weird to be in a sea of orange, but I’ll adjust well. Go Pokes! 🙂 I still have an overwhelming love for my Sooners, though. Don’t ask me about Bedlam. I’m not sure how I will be able to handle it. AHH!! I can’t wait! 2. Does anyone else feel like everything speeds up when school starts? I’m not anywhere close to sticking my little one in school and yet it seems like everything revolves around it! Birthday parties, conferences, etc. We’re pretty slammed for the months of September and October, then it’s Thanksgiving, Christmas, several family birthdays and the arrival of my baby niece! (Due Christmas) Whew! I’ll breathe again in January. 3. I have more projects than I know what to do with! I’ve recently become slightly addicted to Pinterest, and it is giving me all these ideas for making my house super cute. Not that I’ve done any of them. I have a diaper bag I’m working on, then I need to get started on Bluebelle’s Halloween costume. I also plan to make one for my “niece” Kinley, so I’ve got to get started! I also have several outfits I’m wanting to start. I have a dress pattern of my own to make. I have a double needle I want to try. My brother wants a quilt. We’re also planning to make everything handmade for Christmas gifts this year, so I better get started! 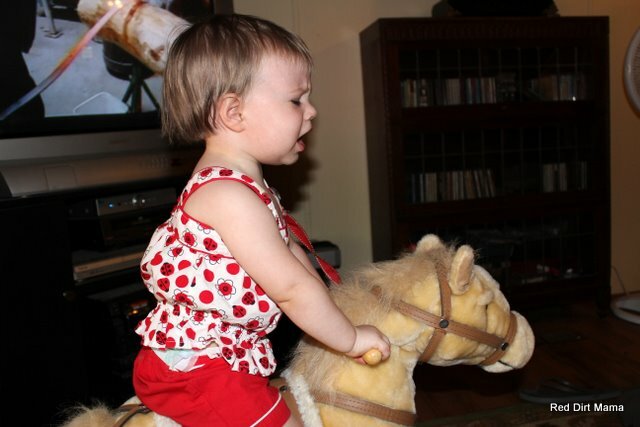 She's still not a fan of the rocking horse. This picture cracks me up. 5. My website is moving!! Starting on MONDAY- you can find me at red-dirt-mama.com! It’s still being worked on, so you’ll see a few tweaks here and there, but I will have an e-commerce store on the website soon! It’ll put all my interests in one place. Speaking of all these changes, you’ll let me know if I get too obnoxious, right? Thanks. I knew I could count on you.